Diamond Platnumz Is in Love, Again - But Who Is She? Tanzanian model Hamisa Mobetto with her new love in America. 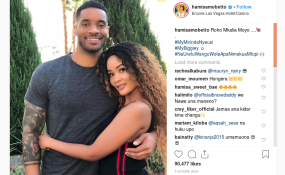 Tanzanian model Hamisa Mobetto has found a new man whom she says is making her love life in America. Hamisa left Tanzania in October to tour across the United States - a trip that is rumoured to be sponsored by her new catch. She is also making guest appearances at events there. A video of the couple engaging in public display of affection has stirred chatter on social media. Hamisa shared a photo on Instagarm of the two of them together holding each other in a loving embrace. She is however still keeping his name under wraps. Hamisa seems to have now put her breakup with bongo star Diamond Platnumz in the back burner. In a recent interview, she termed Diamond 'a bad omen' that had stopped her from exploiting her potential.